Undecoded combination Barcode and Magstripe reader for connection to controllers. 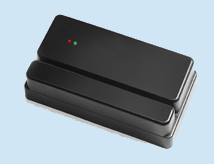 The MagbarU an undecoded combination reader which reads both barcodes and magnetic stripes, for use in a variety of applications. The barcode and magstripe outputs are separate, and can be connected to any device that supports undecoded barcode or undecoded magstripe input. The MagbarU is available with either visible or infrared optics, with a TTL or open collector output, and with track2, tracks 1&2, or tracks 2&3 magnetic stripe.